The official celebration ceremony took place on 10 January in the capital city of Burkina Faso at the International Conference Centre of Ouaga 2000. The group welcomed the presence of President Alassane Dramane Ouattara of Côte d’Ivoire, the current chair of the UEMOA’s Heads of State and Governments Conference. Burkina Faso’s President Roch Marc Christian Kaboré also welcomed the Prime Minister of Guinea-Bissau and many other high-level officials. The event’s theme was “Achieving free movement of goods and people together.” A film with testimonies about UEMOA’s activities over the past 25 years was broadcast by the national TV stations of the eight member countries. 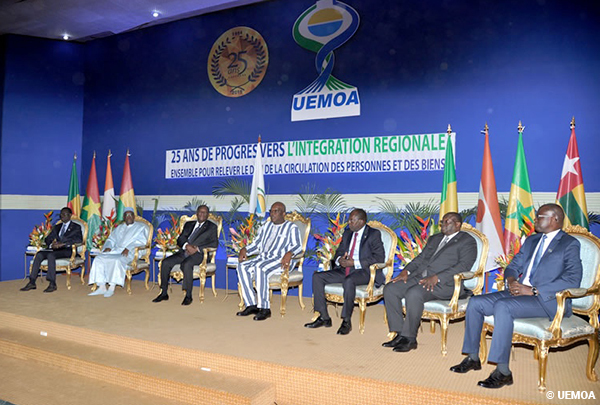 In his statement, President Ouattara applauded the Union’s great achievements in furthering regional integration. However, many challenges remain. President Ouattara highlighted the low rate of intra-community trade (passing from 9.6% in 1996 to 16.1% in 2018); the large number of border controls, delays and illegal imposed levies; the distortion of competition; and difficulties of some companies in gaining access to markets within the union. At the end of the ceremony, the two presidents inaugurated the new UEMOA administrative complex, located in Ouaga 2000.